Ethan: If the Teenage Mutant Ninja Turtles franchise were a film, it would be a little tricky to say what role Bebop and Rocksteady play. Not quite supporting actors, but more than extras, they fill an interesting niche in that world. 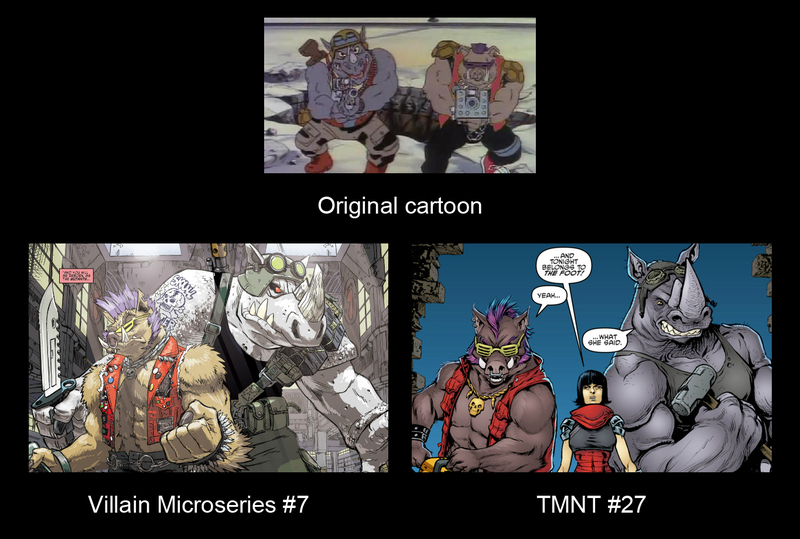 They were originally conceived as a way to pack more mutants into the cast in order to sell action figures, but they’ve grown a bit past that, especially now in their own TMNT issue Villain Microseries 7: Bebop and Rocksteady. 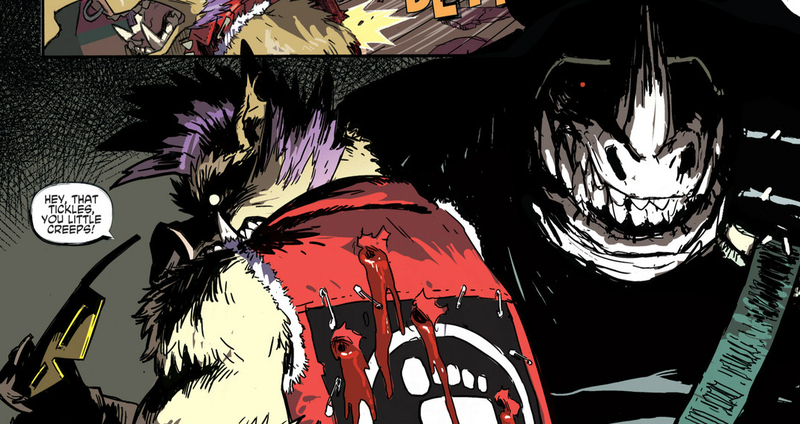 The story and art by Dustin Weaver and Ben Bates gives us a fresh take on their origins and follows their antics and induction into the Foot Clan, taking us right up to the events of TMNT #27, building out the characters into more than just the comic relief cardboard cutouts we saw in the cartoon series and somehow making them both easier and harder to relate to as we see their friendship and violence enhanced in step. Our reintroduction to the duo begins back when they’re still human low-lifes being kicked out of the last gang in town. Since no one else will have them, they jump at the chance to join Shredder’s army and fight their way through a Battle Royale initiation brawl to win their now familiar warthog and rhinoceros mutations. Before they’re officially deemed worthy to be soldiers of the clan, they accompany Karai to a meeting with Xiang Fei Tong, leader of the triad Ghost Boys gang. 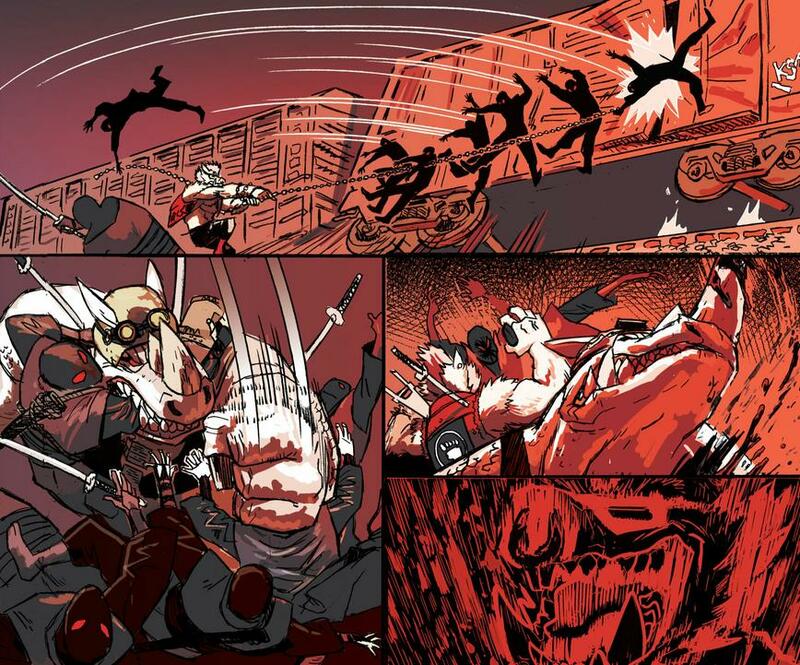 In their typical fashion, Bebop and Rocksteady joke around and end up killing a squad of Tong’s guards, ruining the meeting and sparking an all-out firefight between the two groups. 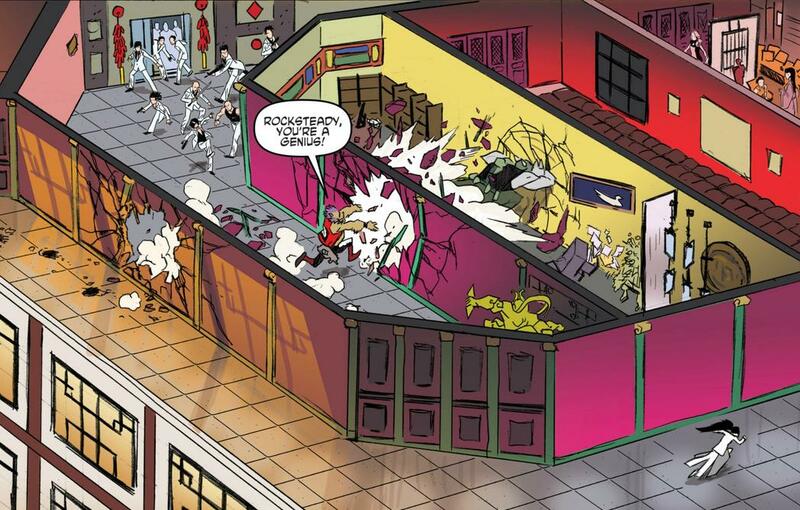 The fight brings down the entire building, summons the police, and puts the two thugs squarely in the doghouse with Karai. They use their newfound mutant durability and strength todefeat her team of assassins and surprise her by telling her that even though she just tried to kill them, all they want is to be part of the Foot Clan. She agrees, warning them that they owe their lives to the Foot. Bates keeps Bebop’s signature sunglasses almost identical, while Santoluoco gives them a Kanye-style revamp into shutter shades; neither artist changes the sleeveless jacket (beacause sleeveless jackets are totally boss). Both reboot styles do grace him with some great, bristly, purple muttonchops though. Bates’s reworking of Rocksteady is also much more conservative – small tweaks to the army helmet and cargo pants – while Santoluoco morphs the helmet into a kind of vintage aviator cap and his pants are traded for a pair of full-on army surplus camos. Great reference to Bebop’s turtle-shell shoulder pads there, too – I guess they were just a little too goofy for either Bates or Santoluoco to condone this time around. If was just a story about a pair of nine-to-fivers making their way in the world, these guys would be heroic figures. Life is hard, but you help each other through it. Trouble is, for all of their somewhat endearing traits, they still harbor a deep, hard-wired instinct of antagonism and mayhem. Sure Bebop’s just trying to lighten the mood and get over his own nerves at being given an important job for once, but even after his bully-move breaks his victim’s nose, he completely fails to see it as a problem. And when the situation gets serious, once blood is drawn, the new mutants let their darker lights shine through. Somehow, Weaver and Bates make this starkly grim shift in visual tone work, mainly because we’ve been shepherded towards this moment ever since we saw them as humans, covered in gouts of blood both their own and that of the bodies around their feet when they proved their worthiness to join the Foot by murdering every last one of their Thug Academy peers. Then we had the nose-breaking practical joke, then the sight of the two with weapons drawn, blithely reassuring Karai that “Things got a little intense out here. We’ve got it under control, though” … by killing half a dozen people. So maybe you wouldn’t want to spend any quality time with these guys, Patrick, but did their lighter side strike you the same way it did me? Now that we have a better idea of where they came from and who they are, do you think they’ll become stock characters in the main TMNT arc, or will they just be a brief bit of comic relief like they were in the cartoon? Patrick: I would actually have a hard time calling this light fare for TMNT. It certainly feels light and fluffy, and crass and violent in a way that trivializes both. Bebop and Rocksteady are — as you say — originally born out of a need to sell action figures, and their cartoon versions always hit that uselessness with unbridled, idiotic glee. This issue comes so close to recreating that, and I had all but resigned myself to appreciate this issue through the lens of nostalgia alone, but then I saw that last image you posted: our bumbling villains revealed to be unstoppable monsters. It’s like in that moment, Bates acknowledges that the clowns we’ve been following around for 20 pages aren’t just clowns – they’re dangerous creatures, uncontrollable and unpredictable. I realized while I was reading that Bebop and Rocksteady have always been a bit like Lennie from Of Mice and Men – at least, that’s the model they were working from on the cartoon, and largely how they’re presented in the early pages here. They’re huge, strong, simple, quick to violence, but they mean well. And that’s where this version is so different – these guys don’t mean well. In fact, their intentions are masked by their ability to roll with the punches, so every time one of them accidentally pets a rabbit so hard that they squash it, they just keep squashing rabbits. It turns their adorable egoism into something much much darker. We’ve talked a fair amount about how these Villains Microseries have allowed a lot of the TMNT writers and artists to contribute to the Turtle Stew again, and I’ve been dubious of this issue since I first saw Ben Bates’ name on it back in September. Bates was drawing the main series during the Neutrino arc, and that story smacked of the more crassly commercial aspects of the franchise. There was a future-y sci-fi battle so littered with potential action figures and cool vehicles, it was hard to see it as anything but an ad for toys that don’t yet exist. 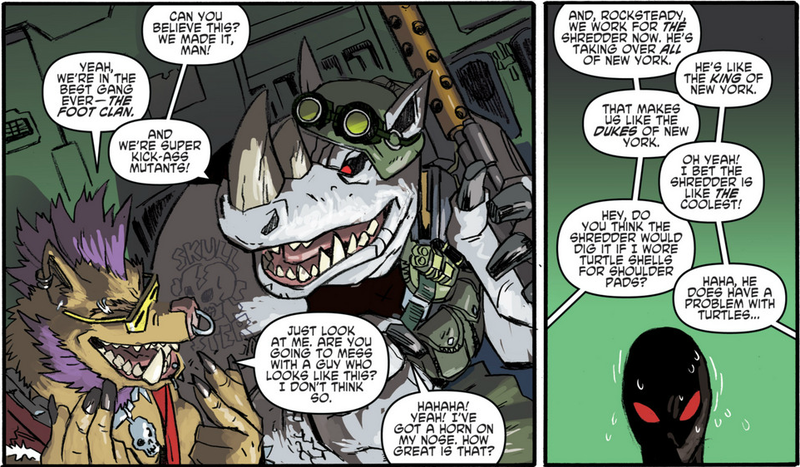 So, anyway, the combination of Bates + Bebop & Rocksteady seemed like a surefire recipe for a repulsive comic. Maybe it’s a function of Bates actively pushing against the reputation of the Neutrino arc, or perhaps he’s just following the tone set by City Fall, but the manic way he juggles the goofy fun and genuine darkness gives this issue all of its energy. My favorite moments are able to convey both at the same time – such as here, when Rocksteady decides that it’s easier to just break down some walls than to chase someone down a winding hallway. There’s a lot that’s fundamentally silly about this drawing – the most obvious of which is the way Bebop seems to be gaily prancing behind his partner. But there’s also the wide, high angle of the camera, which lets us get a perspective on the compound that we’re not supposed to get. Additionally, Bates draws the characters on a Where’s Waldo?-esque scale – and it’s almost disappointing that there aren’t more little visual jokes drawn in here. On the flip side, the terrifying implication that these two lunatics could pop-up where is pure horror. Weaver and Bates are careful never to give too much judgement either way about the pair. They seem to be of-value to Karai, and Ethan pointed out that their moronic loyalty to each other is kind of endearing. I think the implied perspective is that they’re horrible, but there’s enough affection toward their childlike glee that I’m just not sure what impression Bates and Weaver are trying to cast here. For a complete list of what we’re reading, head on over to our Pull List page. Whenever possible, buy your comics from your local mom and pop comic bookstore. If you want to rock digital copies, head on over to Comixology and download issues there. There’s no need to pirate, right? Do you guys remember the Rocksteady action figure? For some reason his head was made of a soft rubber so it came off of his body easily. Way different from your usual TMNT figure which was made of sturdy plastic. I guess Rhino heads require extra care when being made? Anyway, my brother and I would always take off poor Rocksteady’s head and throw it around, because we were 6 and why the hell not? One time, when my mom was working for the census bureau, we were tossing the noggin around when we lost it in her office and were unable to ever find it. From that moment on, my perception of Rocksteady has been tinged with a poignant sense of loss and images of a headless Rhino body, blindly carrying grenades for a task it will never be able to see. Point is, if I had written this review, things probably would have ended up a little different. I also had a Rocksteady with a rubber head, however I also had one with a sturdy plastic head too. I always wondered why it was rubber. Soft head figures were the early run. Turtles had soft heads too. Everything tat came afterwards was hard plastic.